Sew the perfect tunic to express your style—from simple and modest to daring and chic! Mix and match collars, neck plackets, and sleeves for an endless variety of professional, store-quality results. Stitch up a sharp bodice pattern, designed to fit sizes XS to XXL, in assorted lengths, styles, and trims. 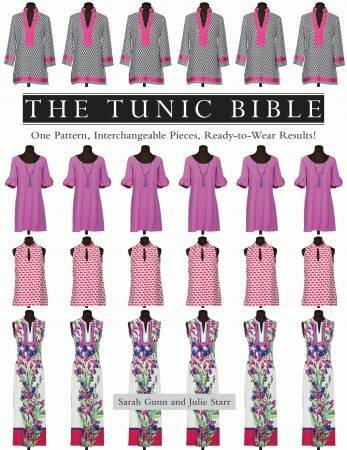 Well respected in the sewing industry for their pattern reviews and online garment challenges, Sarah Gunn and Julie Starr make the tunic accessible and exciting for those with basic sewing skills and beyond. Create chic, ready-to-wear tunics with a multi-length, graded pattern and expert construction tips. Choose your style—casual, preppy, boho, or glamorous—with interchangeable sleeves, neck plackets, and collars. Get advice on shopping for fabric and trims, guided by a huge gallery of inspiring tunic tops.